When it comes to running shoes, I haven't always been the smartest runner. I tend to run my shoes to the ground, realizing one day on a run that's 2 or 4 weeks before race day, that I desperately need new running shoes now. This has happened for almost every race I've ever run...since I started running...and it needs to change. It isn't healthy and I'm pretty sure is a huge reason for the various issues I've had this year (plantar fascitis, IT Band strain), etc. For the last year and a half, I've run in the Saucony Guide 5s. Four different pairs of them. Before that, I was running in the Nike Pegasus. I tried the New Balance 890s for a bit but they didn't even last 200 miles and I thought that they were a waste of money. The Nike Pegasus is a Neutral running shoe. The Guide 5 is a Stability shoe. I'm not necessarily sure that I need a stability shoe. I tend to overpronate very slightly on my right side and I am definitely a late stage pronator. Since backing out from Marine Corps, I haven't done too much running, but I've been doing a lot of research into running shoes, something I've never done before, and looking into not just one training shoe...but possibly three. These are the shoes that are currently on my radar. 1. 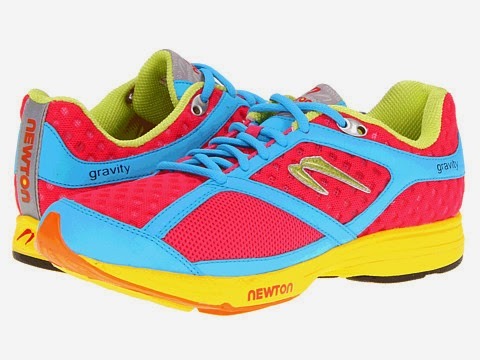 Newton Gravity - Newton is doing something really interesting with their shoes. The deep panels along the balls of your feet encourage mid-foot striking. Prior to my IT band (and simultaneous hip issue), I was a pretty solid mid-foot striker. The reason I'm looking into the Gravity is to try and correct my form and get back to that. Right now, I think Stability shoes are just allowing my feet to continue to pronate, rather than correcting the issue. Newton describes the shoe as a daily training shoe that is both supportive and structured and perfect for the runner who does tempo runs or intervals every now and again...aka me. So, I'm looking at the Newtons as my every day running shoe...something that I wouldn't run anymore than 8 or 9 miles in and would also use for tempo runs and maybe speed work. 2. Mizuno Wave Sayonara - This is a beautiful shoe. 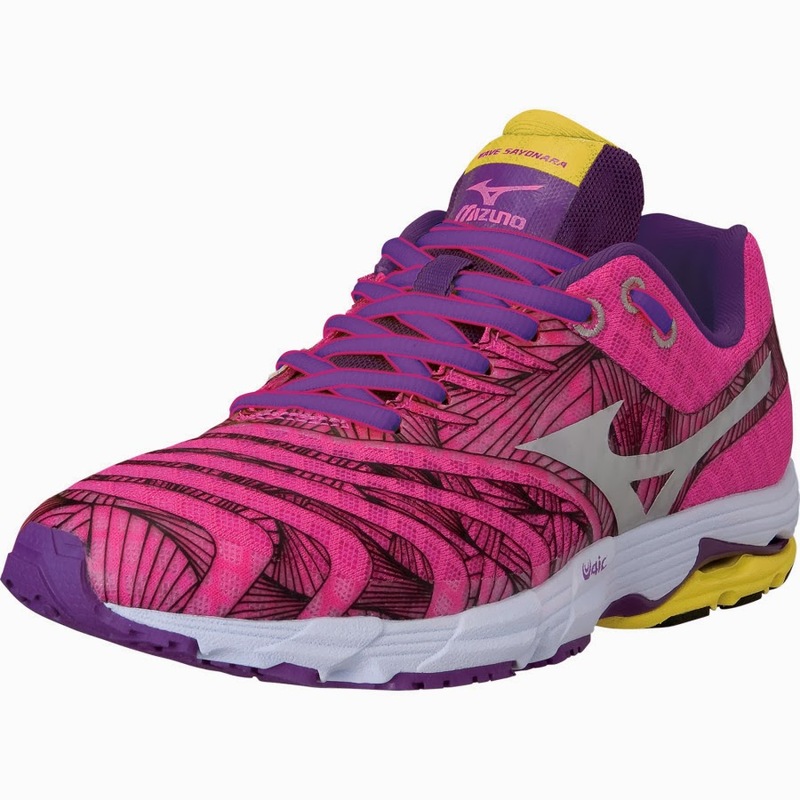 Not only does it come in amazingly fun colors, but this is a shoe that was built to be a running shoe. It's extremely light, has excellent traction and has the cushioning that you need for higher mileage (something I'm used to from running in a Stability shoe). I have yet to confirm this, but someone told me that the Women's shoe is entirely different from the Men's...that it's specifically designed to be a Women's shoe, which is an interesting feature. The Sayonara is designed for fast training and racing, so I 'm looking at for tempo and mid-distance runs (9-16 miles) and possibly as a race day shoe. 3. 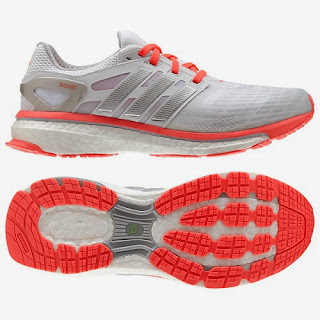 Adidas Energy Boost - Adidas is making a huge push into the running shoe market and I think they're on to something. For years, running shoes have been made with a standard EVA foam. The Energy Boosts are made with their boost technology which is designed to be soft and springy, but still supportive. The arches have low support to design for a more fluid stride. I spent some time talking to a marathoner who runs in these and he said that your foot will feel the same at Mile 1 as it well at Mile 26...which is crazy impressive. These shoes just look comfortable. I'm looking at these for long runs (18 and up) and possibly as Race Day shoes. Now, I haven't gotten into any of these shoes yet. I KNOW. But, I'm doing my research which means I'm learning what I both want and need out of a running shoe, so I think that even if these particular shoes don't do the trick, I have an idea of what I'm looking for. Either way, my goal for next year is to train smart...and that starts with the most important element of my training...running shoes. I'm determined to not only have a full, successful training cycle next year but to finally, finally get that sub-4 I've been chasing for three years. Do you run in any of these shoes? Thoughts? Opinions? I'd love to know! I LOVE newtons! I'm fairly certain that I'm due for a new pair though, but I don't have any running issues when I wear these. I had gotten really bad shin splints a few years ago and needed new shoes bad, I chose Newtons and they transformed my shins, I had ZERO issues, until I realized that they were due for a necessary replacement lol, I tend to wait forever too... I completely understand! I wear tested the newtons at a Pacers fun run. It was a five mile run that I had to cut short to 3 miles because my feet were hurting! But I need a stability shoe in general, so maybe they are just a bad fit for me. I started off in Newtons, and I have to say, they helped my form at the beginning. At my local running shoe store, they have practically a cult following. Once I started running longer miles and training more seriously, though, I feel like they gave me problems (specifically PF) and I know others have experienced this as well!